Tomorrow, January 20, 2011 marks the 31st death anniversary of Oliver Weerasinghe the first town planner and an architect who at one time was the Sri Lankan Ambassador to United States of America. In order to honour the unblemished record of service he rendered to this country as an innovative city planner and a faithful civil servant a garden seat has been erected in his name at the Vihara Maha Devi Park, where he died of a heart attack, while making his morning stroll on January 20, 1980. Oliver Weerasinghe’s father who was one of the first two engineers of Ceylon, married Maria Caroline Thudugalla and Oliver was one of the five sons they had in addition to a daughter. Oliver proceeded to Cambridge University, UK straight from Royal College, Colombo and thereafter joined the University of Liverpool, England for his higher studies, where he preferred to study under Sir Patrick Abercrombie who was an eminent and most respected Town Planner in England. Abercrombie later served as a consultant when Oliver was designing the new city of Anuradhapura. In both fields of town planning and architecture, Oliver gained theoretical and practical expertise and qualified as a fellow member of the Royal Town Planning Institute and a fellow of the Royal Institute of British Architects. He also a life member of the Sri Lanka Institute of Architects and Institute of Engineers and became the head of the Department of Town and Country Planning and the first Government Town Planner of Sri Lanka. The articles he presented in international forums and journals in Sri Lanka and abroad are proofs of his proficiency in widely different fields. Articles on Buddhism and cultural relations denote his affection and dedication to the Sri Lankan culture and Buddhism. Much has been written on Oliver’s contributions in planning the new city of Anuradhapura as the first town planner of the Department of Town and Country Planning and his vision on the preservation of ancient cities was displayed in the new town development exercise. The growth of the modern town on the site of the ancient city was inevitable, but to make it in the manner that will preserve the ancient perspectives and address modern requirements was a remarkable one. Oliver before making any suggestions for the protection and preservation of ancient buildings in Anuradhapura had reviewed the approaches in other countries in handling similar problems. It is amazing to see Anuradhapura New Town as a garden city which attracts not only Sri Lankans but also the international tourists, who visit Sri Lanka. There are other architectural and planning contributions which should be known to the present and future generations of this pioneering personality. Designing of the new wing of the Lake House building during the regime of late D R Wijewardena, Managing Director of the Associated Newspapers of Ceylon Ltd, (ANCL) which continues to house the countries largest newspaper group and planning and the landscape design of Peradeniya University of Ceylon which is regarded as one of the most attractive and beautiful seats of learning are of remarkable creations of Oliver Weerasinghe. 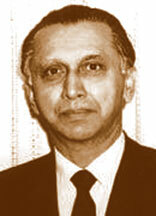 He was the Sri Lankan Ambassador to the United States from 1965-1970, after completing his diplomatic assignment, he was appointed as the Inter Regional Advisor in Urban Development of United Nations from 1971 to 1973 and carried out several responsible assignments in the Middle East, Africa and the Caribbean. Since 1974 Oliver has been practising as a United Nations urban development consultant. There is a saying that behind every successful man there is a woman, this recollects of Cristobel the wife of Oliver Weerasinghe, the only daughter of Sir Henry Kothalawala who represented Uva and Badulla in the Legislative Council and the State Council of Ceylon for 28 years. She says of her husband as a most wonderful husband. Cristobel Weerasinghe after serving the United Nations as an alternative representative of the World Federation of United Nations during 1956-1965, her time is now devoted for the benefits of the poor children of the underserved settlements in Colombo, teaching English, dancing and music for children under Methodist Dancing Centre. Oliver Weerasinghe an outstanding personality has left two children to follow his traditions. Rohan Weerasinghe a duel USA and Sri Lankan citizen is heading a New York based global law firm, Sherman and Sterling which have branches in many European and Asian countries. He is the first Sri Lankan to hold such a prestigious position. Daughter Menaka serves the University of Michigan as a senior academic and has her own firm called Eclectic LLC Alpha Capital Inc of which she is the Managing Director. After the death of Oliver Weerasinghe a dual fund was established by his wife, son and daughter to widen the reading materials available to the students of architecture and town planning forming trust funds for both professions. Oliver Weerasinghe’s contributions to the country will be long appreciated and remembered for many years to come.